Our last look at the 1971 Railway Magazine. From the always reliable letters page, an outbreak of outrage, but from Dawlish, not Tunbridge Wells…. SIR – The photograph facing page 577 of the November issue of The Railway Magazine must be the ultimate in absurdity, caused by the fooling about by photographers with their telescopic lenses. The locomotive looks twice as high as it is long, the signals on the gantry seem to be wider than the track, and the curves of the lines are ridiculous. Television, of course, is also ruined by this sort of thing. Well, here’s the photograph. Looks like a standard, and rather attractive, telephoto lens shot to me. Obviously, such things as perspective hadn’t reached the rural seaside of Dawlish yet..
And finally, a more whimsical exchange, that typified some exchanges through the year – such as the design of Scottish mileposts, and whether the Adams LSWR 4-4-2 radial tanks had been loaned to work to Kyle of Lochalsh in the west of Scotland (consensus was they did.) This is on station names. It was started in November by…. SIR – When the Piccadilly Line extension to Heathrow Airport is complete, there will be five consecutive stations all beginning with the same letter – Hounslow East, Hounslow Central, Hounslow West, Hatton Cross and Heathrow Central. Is this unique? 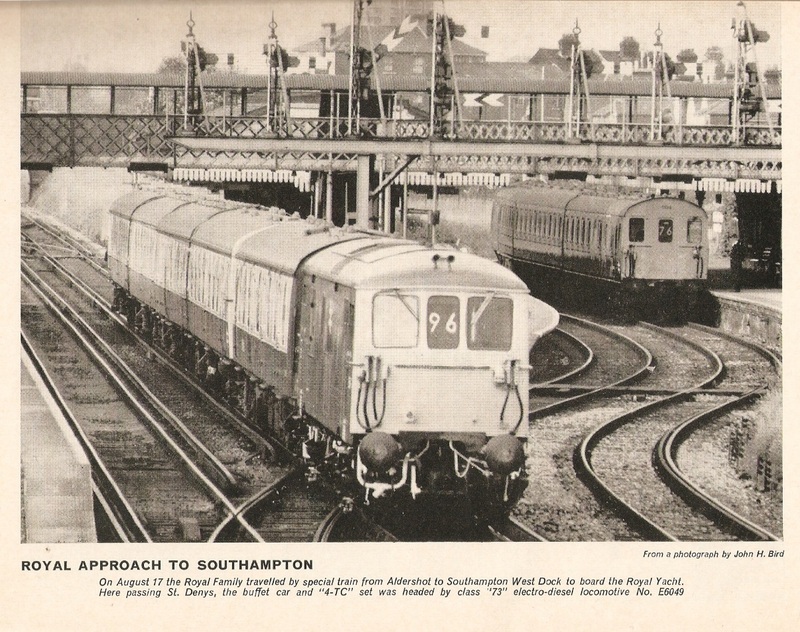 SIR – With reference to the letter (November) concerning consecutive stations with the same initial letter, I would point out that until 1961 there were six stations on the Waterloo-Portsmouth line, all with the initial letter “W”. These were Walton-on-Thames, Weybridge, West Weybridge, West Byfleet, Woking and Worplsedon. The sequence was broken when West Weybridge was renamed Byfleet and New Haw. SIR – Four stations on the “Cuckoo Line” consecutively began with “H”. They were Heathfield, Horam, Hellingly and Hailsham. Although Mr Beauvais mentions five stations on the Piccadilly Line, three of them begin with “Hounslow”, whereas the “Cuckoo” stations are all different. Hampden Park would have made a fifth on the way to Eastbourne, but Polegate intervenes. Horam was called “Waldron and Horam” before the 1939 war, but in later years it was simply “Horam”. SIR – Although the Rother Valley Line has only four consecutive stations beginning with “H”, it also has three consecutive stations ending in “field” – Rotherfield, Mayfield, Heathfield! SIR – The letter headed “Piccadilly ‘H’ Line” reminds me of the staff man, deputising some fifteen years ago for the customary female announcer at Leeds City one afternoon, who spoke of “… the 5:42 to ‘Arrogate, calling at ‘Olbeck, ‘Eadingly, ‘Orsforth, ‘Arthington….” ‘Onest. This entry was posted in Out and about, Prototype, Weird and wonderful and tagged humour, prototype, railway, Southern Electric. Bookmark the permalink.